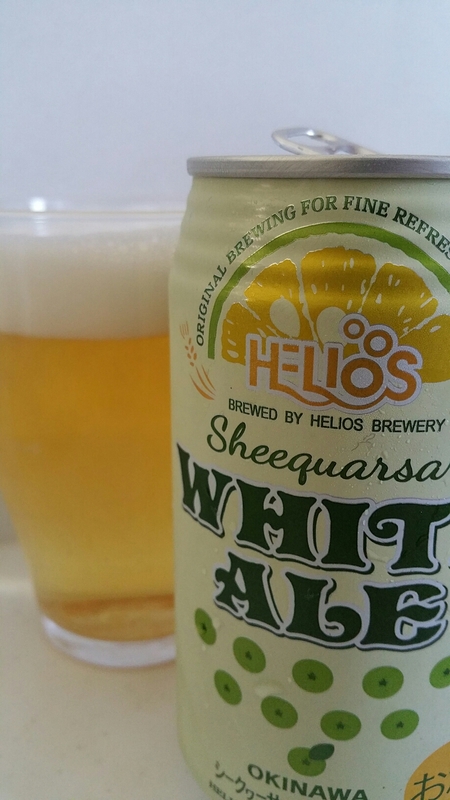 Helios Sheequarsar White Ale is a 5% fruit beer from Helios Craft Beer in Okinawa made from locally sourced sheequarsar. If you don’t know what a sheequarsar is, imagine something like a lime crossed with a lemon and incredibly sour. Helios Sheequarsar White Ale is available readily in Okinawa though quite tough to find on mainland Japan. A bit of back story to sheequarsar. Here at BeerTengoku, we like to think of ourselves as friendly guys and we had a friend, who shall remain nameless, that was crazy for the sheequarsar. Sheequarsar juice was a particular favourite of his, as was sheequarsar soda too. When he went to Okinawa, he was blown away by Helios Sheequarsar White Ale and kept talking about it. At the time, I thought he was bonkers, in fact he still is, but since moving to South Korea, he has not been able to replace his sheequarsar addiction with anything else. So this beer is to you! However, I don’t share the love for the fruit and Helios Sheequarsar White Ale was not something I was looking forward to. I hated the juice, disliked the soda, and actively avoided drinking this beer until now. It poured out a clear golden colour with a fair amount of head as stipulated on the side of the can. Yes, the can tells you the ideal pour for the beer. All I could smell off the beer was the unmistakeable aroma of sheequarsar; a sour limey smell with pretty much no wheat smell though some spiciness came through. It said on the side of the can that sheequarsar juice was used but part of me wondered wether it was natural juice or artificial as it left a sticky, chemically tinged syrup around my mouth. The bitterness of the fruit helped bring through some of the wheat in the body though saying this is based on a Belgian witbier would do that style a disservice. There was no existence of malt taste anywhere in this beer, so I wonder if it’s more of a chu-hi, or fruit liquor, than a beer? Calling Helios Sheequarsar White Ale a beer is disparaging to beers. If you like chu-his then you will like this, else drink it only if you have nothing else left in the fridge. I thought it not bad but I seriously think the sheequasah belongs better in an IPA, its that kind of sharp flavor. This white ale will also have coriander and possibly lemon or range to make that weird flavor. Not best choice for this fruit, IMO. I kind of told the helios people that.